Can you tell us a bit about your society? Leeds Women In Leadership Society was founded to empower students to reach their full potential irrespective of gender, ethnicity, socio-economic status or any other factor. The society has 4 different divisions Finance, Business STEM and Humanities whom organise events to cater to different interests of students. We strive to raise awareness of the importance of inclusive workplace environments and help our members develop the soft and technical skills they need to become successful future leaders. Our events range from skill workshops, networking evenings with professionals, panel events, conference trips and socials, bringing our like minded members together to develop skills and enhance knowledge of their chosen field. Our other initiatives include organising our own conferences such as the inaugural ‘Empower Conference’, celebrating diversity and inclusivity across various different sectors and ‘Leeds Finance Summit’ aiming to make access to finance firms and professionals as accessible to students as possible. We also run a mentoring scheme, matching first year and final year students based on their career interests for tailored and personal support as they attempt to gain work experience. What are your society's biggest achievements over the past year? Since forming in March 2017, we’ve grown to almost 900 members representing over 100 different degrees at the University of Leeds. Our proudest achievements come from the success stories of our members who through our events, workshops, networking opportunities, and mentoring scheme have obtained work experience. We also achieved corporate sponsorship from 7 different firms recognised for their diversity and inclusivity initiatives: KPMG, Accenture, TPP, EY, MARS, RBS and Allen & Overy. This allows us to offer free membership and keep event costs down to ensure the society is as inclusive as possible. Nationally, our work has been recognised at the NUE Society Awards where we won Best Campaigning Society and were nominated for Best New Society in 2017. This year, we’re returning to the NUE Awards 2018 nominated for Best Campaigning Society and Most Improved Society. How did you hear about the NUE Awards? 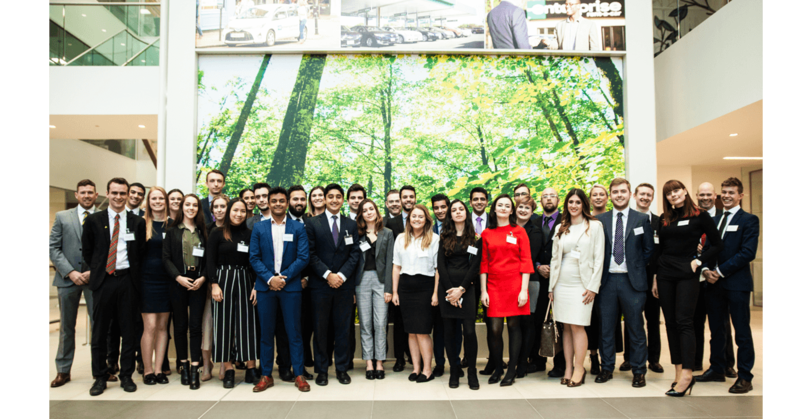 When we first formed, we recognised how much we could learn from more established societies around the UK, such as last year’s NUE Best University Society Winner Warwick Consulting Society. Through our interactions with them, we learnt of their success with the awards and knew this was something we wanted to become involved with this year. We applied for the award because we wanted recognition for our efforts on campus in Leeds. We also knew that we could use the £1000 prize money to really improve the experiences of our members. Did you know about Enterprise Rent-A-Car before the judging day at their HQ? We knew of Enterprise Rent-A-Car from their industrial placement year and graduate scheme opportunities, but the judging day at their HQ was a great opportunity where we learnt more about their interesting history and structure, as well as having a tour of their swanky offices. Everyone we had the chance to speak to from Enterprise Rent-A-Car staff were incredibly friendly and helpful and had such positive things to say of their workplace. Take a look at Enterprise Rent-A-Car's one-year Placement and Summer Internship opportunities here! The judging day was really interesting and engaging! It was a great opportunity to mix with other societies from so many different universities around the country, and learn about what they do. It was also interesting to learn more about the history of Enterprise Rent-A-Car and their business model from their friendly, welcoming staff. How has your perception changed of Enterprise Rent-A-Car? Before attending the judging day, we had very limited knowledge of Enterprise Rent-A-Car. We knew of the work experience opportunities they offered students and their function as a car hire service. However, the exercises of the mock assessment centre they organised for us helped us learn more about the different strands of their business, such as the Enterprise Car Club and the history of the firm. We were also treated to a tour of their very swanky offices where we had the opportunity to speak to their employees. Everyone was so friendly and welcoming and had very positive opinions of their workplace, making it clear that this is a great place to work! Nominations for the NUE's end on the 7th November, don't miss out! What did you think of the NUE Awards? The NUE Award Ceremony was amazing! Thank you so much to the RMP team for all their hard work to pull off such a fun, engaging event. We really enjoyed the opportunity to network with different professionals and hear those involved in the recruitment industry speak about work experience. What did it feel like to win the NUE Awards? Fantastic. Amazing. Surprising. Hearing our name called was an amazing feeling that we’ll remember for many years to come. What advice would you give to societies looking to nominate in the NUE Awards? Show your passion! It doesn’t matter how big your society is, or if what you do is a bit out of the box, show that you truly believe in its mission and show the positive impact of what it is doing on your campus! Why should societies nominate in the NUE Awards? 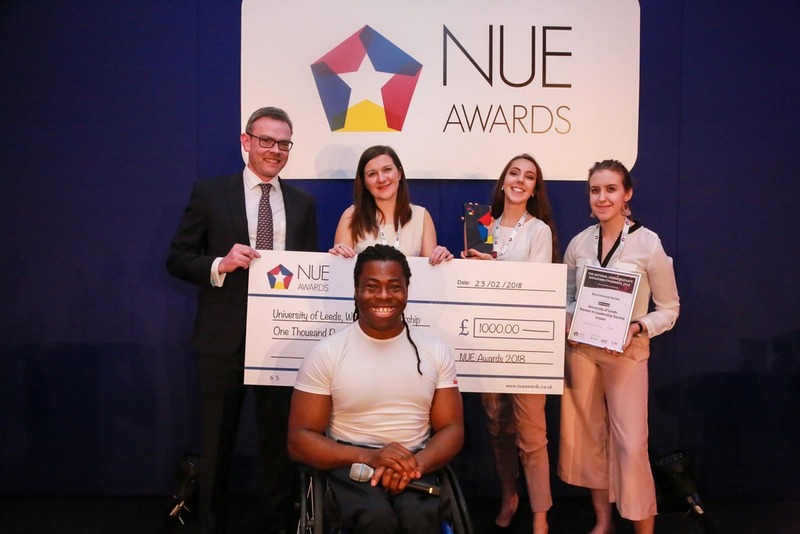 Every committee works so hard to organise events for their members, and the NUE Awards is your chance to show that hard work and get recognised for it! If you’re thinking about nominating your society, do it! You’ve got nothing to lose and the process is a great learning experience.